At first glance, the grasshopper sparrow may not look like much. Native to the tallgrass prairies of the American Great Plains, it’s a small brown and black-speckled bird with a wingspan of 8 inches. But this little bird is gaining recognition for its unusual behavior: it has an amazing ability to cover long distances over a short amount of time between breeding attempts. Emily Williams, an avian ecologist at Konza Prairie in northeastern Kansas, first observed this behavior when she noticed a few tagged grasshopper sparrows had made large movements over the course of their breeding season. 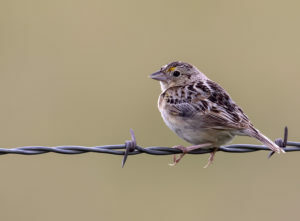 To better understand the dispersal patterns, Williams fitted Grasshopper Sparrows with colorful leg bands and small radio transmitters to monitor their populations in 18 plots over three years. Each plot was also experimentally managed with cattle grazing and fire treatments to mimic natural disturbance regimes in the tallgrass prairie ecosystem. Williams’ study revealed that grasshopper sparrows have a remarkable capacity for movement over their short breeding season. Between 33-75% of individuals dispersed each season and over half of the males moved to a new territory each month. And they weren’t just hopping next door. The little birds travelled up to 9 km between breeding events. The density of territorial male sparrows per plot varied by month and by experimental disturbance regime, but even in plots with constant density, the researchers identified a rotating cast of individuals. The researchers believe that grasshopper sparrows disperse frequently due to a mix of ecological factors (i.e., disturbance frequency, habitat quality, food, predation risk), as well as breeding factors, such as high density of territorial males and nesting success of competing males. Williams’ next steps are to study why Grasshopper Sparrows move so frequently during breeding season, and what shapes their settlement decisions. Researchers hope that by learning how and why grasshopper sparrows move so frequently, they can offer insights that will improve conservation efforts for this declining species. Source: Emily J. Williams and W. Alice Boyle. Patterns and correlates of within-season breeding dispersal: A common strategy in a declining grassland songbird. The Auk (2018), 135 (1), 1-14.